The mathematical form of the energy terms varies from force-field to force-field. The more common forms will be described. Obviously only small changes in r are allowed as to large an r value would lead to bond breaking. The bending energy equation is also based on Hook's law. The kΘ parameter controls the stiffness of the angle spring, while the Θ0 is the equilibrium angle. As above, the graph of E vs theta is expected to be a parabola. The torsion energy is modeled by a periodic function, much as you have seen with energy plots associated with Newman projections sighting down C-C bonds fro butane, for example. 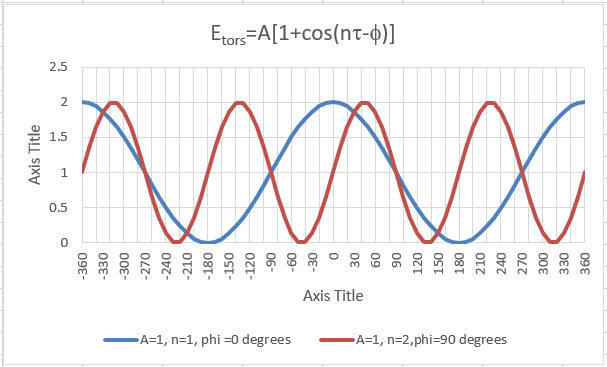 phase shift Phi: shifts curve along rotation (tau) axis. parameter controls its periodicity, and phi shifts the entire curve along the rotation angle axis (tau).